Sales and profits are on the upswing for this packaged food specialist. What: Packaged foods specialist J.M. Smucker (NYSE:SJM) saw its stock jump 18% in June, according to data provided by S&P Global Market Intelligence. The rally helped push shares to a new high, with a 23% gain so far this year. So what: June's spike was powered by a quarterly earnings report in which Smucker revealed that sales rose 25% year over year as profitability surged. The revenue bounce came from its purchase of the Big Heart pet food business, but its core business also saw solid growth with sales up 5%. 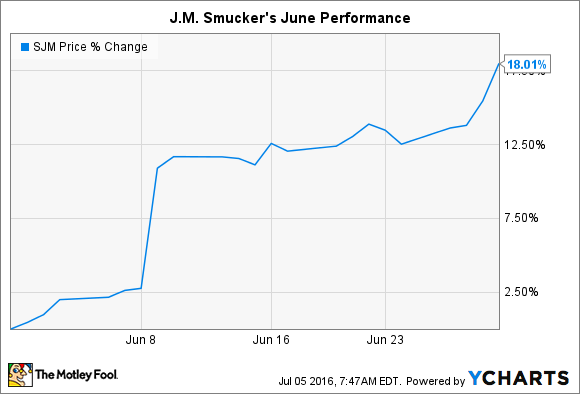 What really has investors excited is Smucker's rising profits. Its coffee business accounts for nearly a third of all revenue and its enjoying strong demand for Folgers K-Cups and Dunkin Donuts branded products. At the same time, falling coffee bean prices are making packaged coffee an extra profitable enterprise. Gross profit margin in the division spiked by 7 percentage points to 30% of sales. That success has translated into a doubling of net income over the past 12 months, to $690 million. Now what: CEO Mark Smucker and his executive team plan to cut a further $100 million of costs out of its business as they fully incorporate the new pet food division. And after achieving record sales, cash flow, and profits in fiscal 2015, management is "confident in achieving another year of strong earnings growth." To achieve that goal, Smucker will have to continue innovating across its coffee, consumer food, and pet food brands. It will also need to make the most of its Olympic games sponsorship in hopes that its marketing campaigns resonate with consumers. Executives aren't counting on much sales growth over the next four quarters. In fact, revenue is projected to dip slightly. However, if Smucker can continue boosting its net profit margin, the stock could see additional record highs ahead.